A cowled version of the modern Batwoman. @the good Mr.Hebert: Cool! That’s really good, right up there with Neil Adams artwork. Looks really cool. Is the red hair your idea or tradition? Either way, I like it. Nice memories of Lana Lang. It’s traditional, starting with the Barbara Gordon iteration of the character and continuing with the most recent lesbian version (just recently canceled, thus the impetus for my recent takes on her). Looks good. 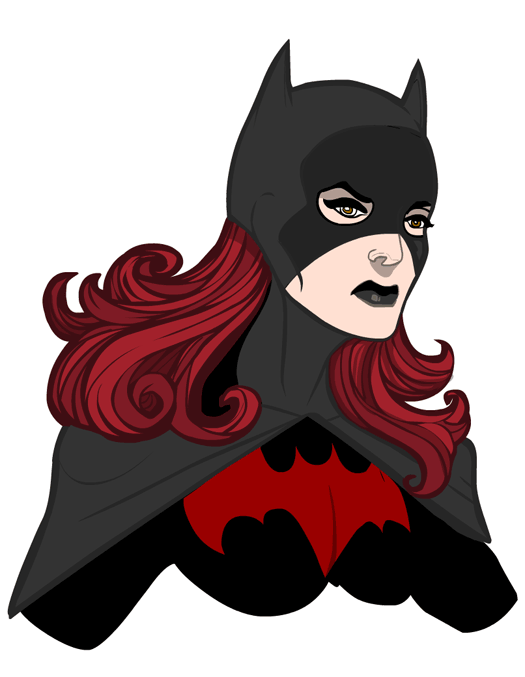 I’ve been reading Batwoman and I’m sad it isn’t going to be sticking around. I’m pretty sure that Batwoman uses the Batman Beyond symbol though. The lesbian version? Please tell me they did a full page picture of Batgirl and Wonder Woman naked in the shower kissing each other on the lips, then tell me where I can buy that issue. Now I need some quiet time. hey dude can you make hero maker 3 in the same way as 2? and make move the part and an extra option instead? The new 3 looks stupid to me please make more like the second it was awesome!!!! If you DO want to use 3, then don’t use the move-the-part feature. It IS optional. You can use the program perfectly fine without moving or coloring or flipping or duplicating or masking or anything. Simple don’t do those things — use it just like 2.5, clicking on the items you want and they’ll appear on the character in an appropriate spot. hey man it is pretty good but you should see my batwoman its got the hole body it likes just like yours but with legs and all of that stuff.